The Maya Calendar by The Maya World Studies Center (Centro de Estudios del Mundo Maya), in Yucatan, Mexico, is an exclusive document whose graphically enriched text presents valuable information about the calendars used by the ancient Maya in a way all can understand. This fine document is a white card made of heavy quality stock that measures 24 by 12 in (60 by 30 cm), the card folds in half lengthwise and has four color printed pages. The front cover shows a beautiful painting of the Maya Calendar which has all the elements this calendar is made of. The card opens to view two inside pages that give easy to understand information regarding the History of the Maya Calendar, the Maya Numbers and Calculation Units, and general knowledge about the calendar. Text and graphics explain the Maya Time Periods, their names and their length. A large central image with its corresponding text explains the Maya Calendar Round. Additionally, there are explanations of the two calendars most widely used by the Maya: the Tzolkin, Ritual and Agricultural Calendar, with the glyphs it uses and their corresponding names, and the Haab, The Solar Calendar for Religious Celebrations, its glyphs and their names. Also here you will find information related to The Calendar Round and the way the Maya integrated the Tzolkin and the Haab calendars to come up with unique dates that will not repeat themselves in 18,980 days. The back cover has the traditional Maya Song to the Sun in several languages. Our calendar is also available in Spanish, French, Italian and German. 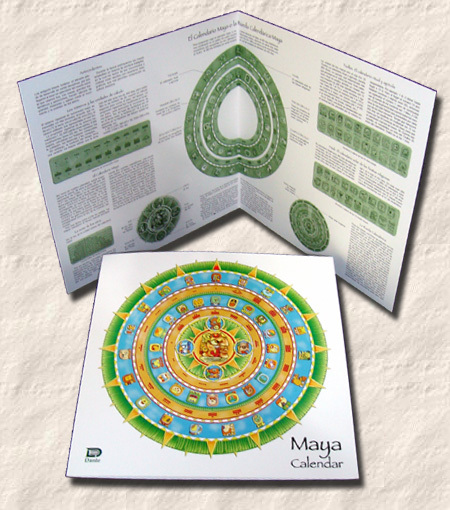 The Maya World Studies Center asks for a contribution to send you this unique and useful calendar that is a collector’s item and an exceptional gift. headquarters in Mérida, Yucatán, México.